The St. Johns Water Management Area (SJWMA), known to most anglers as the Farm 13/Stick Marsh, is a 6,500-acre impoundment located along the east coast of Central Florida in northwest Indian River County. Water depths range from 4 to 8 feet. Boaters unfamiliar with the SJWMA are advised to navigate to fishing locations with extreme caution due to the number of man-made and natural hazards present. Facilities include a double lane concrete boat ramp, air boat launch site, restroom and paved parking lot. Closest towns/cities are Melbourne, Palm Bay, Vero Beach, Sebastian and Fellsmere. No gas, food or bait available on site. Popular sportfish include largemouth bass, bluegill, redear sunfish, black crappie and several catfish species. Stick Marsh fish for largemouth bass will be on a hot weather pattern good catches are still possible for those who can adapt to the changing conditions. Those on the lake at first light will likely have the most success before the morning sun intensifies. Many local anglers prefer the late evening bite, especially after the thunderstorms have dissipated, as the best time to fish for bass. As midsummer approaches, look for bass to be distributed widely throughout the reservoir, oriented to the shallow tops of underwater levees and woody structure along the western and southern shorelines. The intersections of the submerged north-south drainage canals in Farm 13 should also hold good numbers of bass. 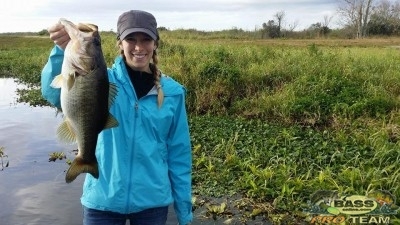 During the onset on the rainy season, anglers should also key in on water control structure outflows, as bass will school up in these areas to feed, often generating a strong bite. Angler surveys conducted between January and April 2007 of this year did indicate a noticeable drop in effort, catch and success for all sport fish including bass. This time of year, the diet of largemouth bass typically consists of threadfin and gizzard shad. Artificial lures that imitate shad, including top-water, shallow-running, and deep-diving crankbait, should be anglers’ best bets. As always, golden shiners are the live bait of choice for anglers searching for trophy bass, followed by plastic worms. Black crappie (speckled perch) fishing can be rewarding this time of the year for those anglers willing to seek them out. Look for them in and around deep-water structure, such as in Ditch 7 or along the drop-offs of underwater levees and ditches. Small jigs (1/32 and 1/8 ounce) with twister-tail or tube style tails and minnows should be productive in deep water and along grass lines. Bluegill and redear sunfish (shellcracker) will be found feeding and spawning along the perimeter levees and tops of submerged levees. Live crickets, worms, and grass shrimp will be the baits of choice, followed by beetle spins, and small jigs. Catfishing on this reservoir is usually quite good, with traditional baits and methods all being productive.